It’s easy to imagine author Dixon sitting in libraries and film archives taking copious notes. Unfortunately, it is equally easy to imagine him taking his stack of 3 by 5 index cards into the publisher’s office and depositing them on the desk. The publisher seems to have gone ahead and published the notes as is. The result is not so much a book as a compiled, and quite extensive, laundry list of, as the title promises, a history of horror. Much like an abstract piece of music that wanders endlessly searching for a melody, Dixon’s notes often seem to be in wandering in search of a connective narrative. The historic notes are interesting, but they seem like the kind of information usually found in footnotes or an appendix of sources in a scholarly tome. There are factual notes, anecdotal notes, notes about films, about actors, about directors, about scripts, and about notes. We are doused with a shower of tidbits about the past (into the 1800s), present, and future of horror films in America and around the world. Some of them have the air of the Hollywood gossip column and others report on little known or forgotten facts. There is a wealth of research material here for anyone willing to follow Dixon’s many threads. Of course, there are a goodly number of gems tucked into the taster menu of fact snacks. For example, the author offers generous and moving portraits of three American giants of horror: Bela Lugosi, Boris Karloff, and Lon Chaney, Jr.
Hungarian born Bela Blasko, who took the name of his home town of Lugos and became Bela Lugosi, was once an adored iconic figure in the horror film genre. A terrible combination of bad choices, bad luck, drug addiction, and the capriciousness of Hollywood, threw Lugosi into a downward spiral that ended when, in the late 1950s, he died while filming Plan 9 from Outer Space, often found on lists of the worst movies ever made. Boris Karloff (born William Henry Pratt) had a much less tragic path. Although he is mainly remembered for his signature role as the monster created by Doctor Frankenstein, his career spanned a wide range of other work. His many successes included playing opposite Julie Harris on Broadway and enjoyed playing Captain Hook in the popular television version of Peter Pan. Dixon’s book is illustrated with a sprinkling of photos from the classic moments of the horror film genre. We see Lugosi as Count Dracula, Karloff as the Frankenstein monster, Linda Blair looking possessed, Sissy Spacek covered with blood in Carrie, an unusually maniacal Jack Nicholson from The Shining, and more gore-bedecked actors than one could shake a skull at. 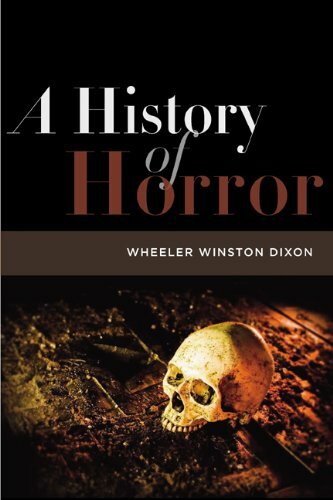 A History of Horror is a fine book for trivia buffs with photographic memories, or people with quick pens who are compiling their own stacks of 3 by 5 index cards.